AN ATTRACTIVE PARCEL OF AGRICULTURAL LANDS APPROX. 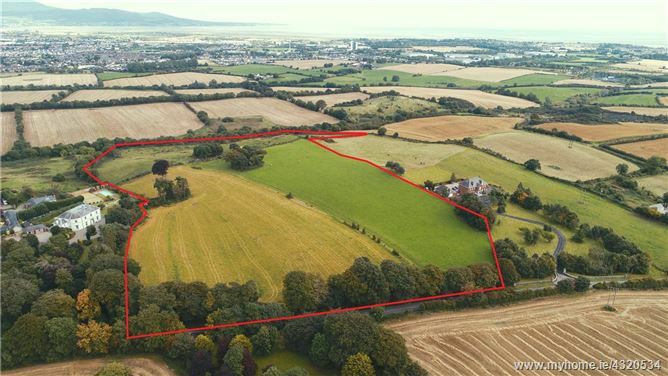 24.25 ACRES / 9.82 HECTARES WITH DEVELOPMENT POTENTIAL IN THE FUTURE SOME 3 KM FROM THE BUSY TOWN OF DUNDALK, IN THE HEART OF COUNTY LOUTH. Ballybarrack Lands is a short distance from Dundalk Town, with a population of around 40,000, is a popular location for tourists and has numerous resting places and restaurants that cater for all family needs. The nearby M1 offers excellent access to the Dublin City, Dublin International Airport and Belfast, all within similar commuting distance. The property is well placed for a variety of sporting activities in the surrounding area, giving easy boxing distance to most meets. There are excellent equestrian centres nearby, such as Ravensdale Lodge Equestrian Centre and Parkview Equestrian Centre. Dundalk racecourse is a popular location for horse racing enthusiasts and there are many evening meets for one to pick from during the year. Dundalk Golf Club is a short distance from Ballybarrack Lands and Ballymascanlon Golf Course is also within easy driving distance. There are also several GAA, tennis and soccer clubs within a short distance. The lands are well sheltered and include some 24.25 acres / 9.82 hectares of grazing pasture excellent for cattle or indeed horses located to the east and north east of the property. They are also drained well with mature hedging surrounding most of the boundary. There is an agricultural access point directly into the property from the main road. The lands are currently zoned residential 2 by the Local Authority which is to provide for new residential communities and supporting community facilities subject to the availability of services.